We’ve done it again! For the fourth consecutive year, we return to visit the African country in search of new solidarity and sports adventures. Cameroon has been the chosen country by 2017. They call it “Africa in miniature” because of its geological and cultural diversity: it has beaches, deserts, mountains, forests and savannahs. At the sport level, its long tradition of soccer stands out, being the African country that more times has participated in a world-wide one of soccer. He has world-class players such as Samuel Eto’o, Roger Milla and the legendary Thomas N’kono, the current RCD Espanyol goalkeeper. On April 9th an expedition of 30 people took the trip to the African country, where the main media of Yaounde, the capital, awaited us. After a concurred press conference with the main local television stations, we trained to adapt us to the humid climate of the area. The 11th was the expected day. The day we would face the Yaoundé Dragons, as classified by the Cameroonian League. Until the 60th minute the result was 1-1 (Goal Kevin Caballero), but finally the physical superiority of Africans was imposed, which ended up scoring the frankly set. The final result was 5-1 but, as always, it is the least important. What we take home is, once again, an incredible experience. With this trip we have managed to break records. Thanks to the solidarity of all the partners, friends and companies of Vallès Oriental we collected about € 10,000 for the beautiful project that the Catalan NGO Insolàfrica is developing in the town of Kribi: the construction of a library at the School of Nursing . It should be noted that 700 kilos of school and sports material were also taken, which were distributed among the children of Kribi and the subsidiary of the Dragons of Yaoundé. Without a doubt, one of the key moments of the trip was the act of placing the first stone of the library that will be named after our Club. The children of the NGO received us with typical songs and dances of the region. They were crazy with emotion to see us and play with us. It was a moment that touched us all. One of the other special moments, apart from the delivery of solidarity and sports material, was the delivery of our solidary book “Jan’s Dream”, to several children of the NGO Insolàfrica, and draw in the black and white illustrations. A book that also served, apart from other initiatives, to raise funds to build the library in Kribi. Each and every one of these adventures has been really magical. They enrich us not only as people, also as a club. We receive good news from Cameroon. Half a year after our visit to the country, we get pictures where we see the advances that have been achieved with the material that we took them in April. 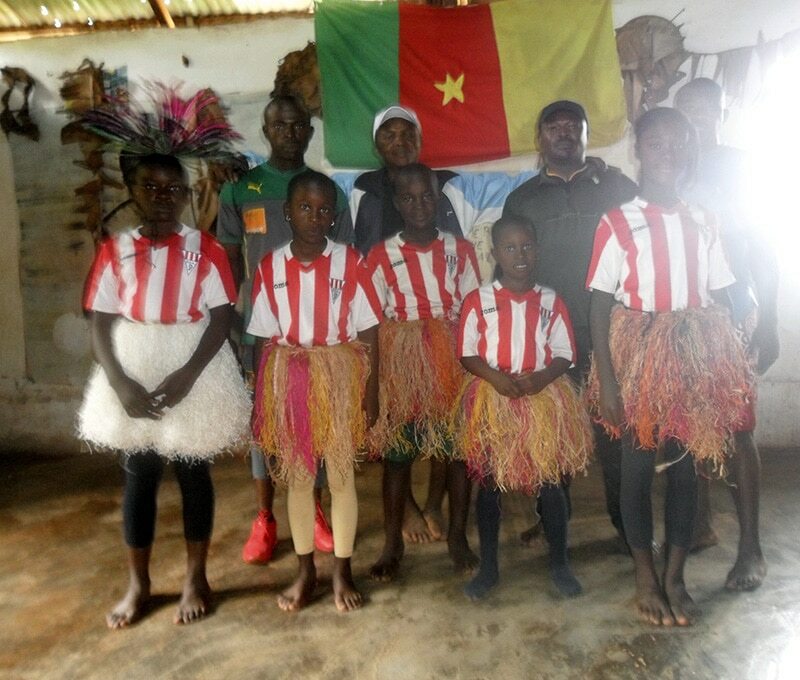 To our friends in the Etetack district (located in the upper part of Yaoundé), we delivered t-shirts, balls and sports equipment, which have been used to create football teams that bring together children and young people. The team, named “Ramassà Espoir de Etetack”, is already in full swing and has participated in summer tournaments. Currently, he is in the process of joining the Cameroon Youth League. On the professional side, the help of A.E. Ramassà will allow them to supervise and train young people in trades such as computing, mechanics, parenting, etc. Our collaboration has also contributed to social awareness, organizing awareness sessions and educational talks for young people, helping them to discover the concept of Ubuntu. In the cultural sphere, they have created a theater and dance company; the “Compagnie Ramassà”, where they teach boys and girls to practice traditional African dance, as well as contemporary dance. Children also learn music (in particular, percussion) and theater, always related to the Ubuntu ideology, a philosophy of life created by Desmond Tutu oriented towards the loyalty of people and the relationship between them. The theatrical company of the A.E. Ramassà has a very encouraging project at hand. On December 20th the association organized a solidarity cultural evening in order to raise funds for the development of a water point for the population of the Etetack district. On that day, contemporary dance, traditional music (with percussion and drums) and songs were presented live. Also there were other artists of international renown, like Mr. Tiomela Dany Stéphane, artist, choreographer, dancer, drums and playwright responsible for “Cie RAMASSA Cultura”. To put it in context, Etetack is a suburb located on the outskirts of the north of the city of Yaoundé. It is a neighborhood with a cosmopolitan and heterogeneous population. It is known for the modest quality of its buildings and the low purchasing power of its inhabitants. 75% of the houses are constructed of precarious materials and one of the main problems with which they are found is the little supply of potable water. The neighborhood is not completely filled with drinking water, raising its price for the neighborhood population. This causes almost the majority of the population to consume mountain water that they must go to collect in the forest. This is a very difficult task because there is often a large influx of water in the water point and it is necessary to wait for hours to have a can or a drum of water from the mountain. In addition, it should be taken into account that the place where this water point is located is very unhealthy because the instruments used to channel and collect water are made from improvised materials. The goal of cultural afternoon is to achieve skill and clean the drinking water point to guarantee the healthy conditions for the population of Etetack.